Norman, OK – January 8, 2018 — Weather Decision Technologies, Inc.® (WDT), the world’s leading decision support and weather analytics company announces the release of RadarScope® 1.0 on the Microsoft Store in Spring 2018. Version 1.0 will include basic RadarScope functionality, with in-app purchases of Pro Tiers 1 and 2 arriving later this year. The app is currently available for Android, iOS, and Mac. The Windows release is scheduled to arrive just in time for the peak of severe weather season. 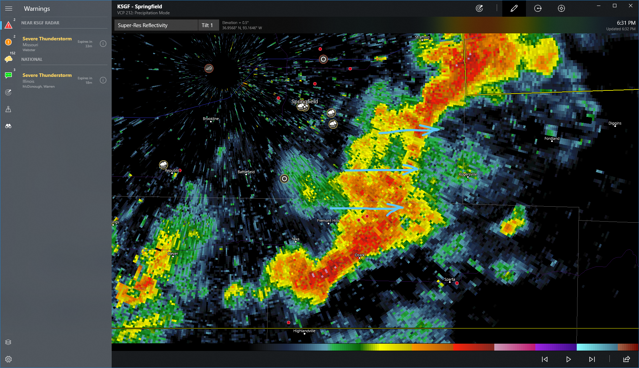 Designed for weather enthusiasts and meteorologists, RadarScope is a specialized radar display app. This Top 10 app allows mobile, Mac, and tablet users to view and interact with high-resolution weather radar images, lightning data, and severe weather warnings. The latest reflectivity, velocity, and other radar products from any radar site in the United States, Canada, Guam, Puerto Rico, South Korea, and now Japan can be displayed on this premium app.